We called a taxi for a 9:45 pickup in Motor City and headed straight to the canal area of Dubai. The taxi driver dropped us right in front of the Dubai Museum by the canal and we started walking around the souk, which is what they call their local markets. 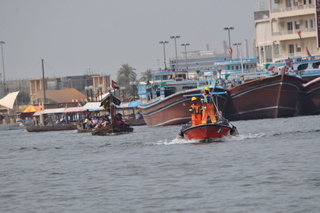 The souk on that side of the river was all textiles and didn’t seem very interesting, so we decided to go walk into a mosque around the corner and then took a water taxi across the canal to the area that Kara told us to go to, the Spice Souk. The little water taxi was really cool and provided some great photo opportunities, it also cost only $.028 per person for the service. That was great and gave us a wonderful perspective of the city and how it was when first developed in the early 1960’s. 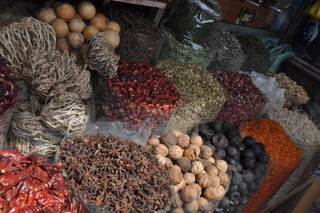 We arrived at the spice souk only to be wisked into a museum on the second floor of a small building. It turns out that this was the original city office for Dubai back in 1960 and they had a map of the original plans for the city and a 4 minute movie on how the city concept was developed. It took about 7 minutes to go through the entire museum and there was a nice balcony to take some pictures of the river. From the museum we found our way into the spice souk and it smelled sooooo good! 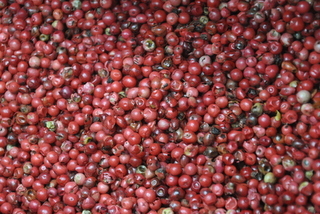 Dried berries by the thousands. At one of the first shops we stopped we tasted some pistachios, which were delicious. We ended up buying pistachios, almonds, some dried mangoes and some chocolate covered dates. The mango was devoured in about 3 minutes and then we started digging into the pistachios. After an hour or so of walking around we headed for the Metro to find our way to Burj Khalifa, the tallest building in the world. 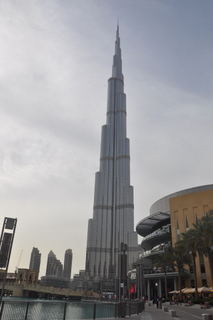 Attached to the Burj Khalifa is the Dubai Mall which is supposed to be the biggest mall in the world. It was over the top! The mall had every shop you could imagine with 4 floors of shops and what seemed to be over a mile square. We walked and walked all day around this place. We stopped for some lunch, took a look at the monstrous salt water aquarium, took a quick peek at the indoor waterfall and then headed to see the Burj Khalifa. It was so tall you can’t really imagine without seeing it. We looked to get tickets to go to the top of the tower but they were booked out for at least 2 weeks. We got some amazing pictures around the building and took some time to rest before heading to meet our hosts, the Coles, at their school. Dave and Kara are teachers at the American School of Dubai. They have two daughters, Isabel is 13 and Abigail is 12. They are world travelers and have only gone to school outside the US. We got to the school around 4:45 and got a quick tour of the library and the school before heading out for a wonderful dinner down by the ocean overlooking to world’s most expensive hotel, the Burj Al-Arab. We ate well and headed back to the school to watch the high school talent show, but that wasn’t in the cards for me. On the way back to the school I felt that familiar pain that comes with passing a kidney stone. I was having some pain earlier in the day but didn’t think anything of it. I asked Dave if he could take me back to the apartment and leave everyone else back at the talent show, which is what we did. Since I have passed a few stones over the past 6 months I came prepared with some heavy medication so I could get through another episode, which is what I did. Ilise and the rest of the gang came back and I was doubled over in pain. I couldn’t get comfortable for the life of me no matter what. This might be way too much information, but it took me about 3 plus hours for the stone to dislodge and for the pain to go away, which was around midnight. For the next 2 ½ hours we sat talking with Dave and Kara about life, our families and everything in between. We had a 5:45 AM pickup and went to bed around 2:30 AM, so, not much time for sleep. I was feeling much better so not getting much sleep was not a big issue after all that pain! We awoke this morning, got everyone awake, said our goodbyes and headed off in a taxi. We didn’t get a chance to take a video, which is a shame, but hopefully we can get them to create one and send it along. This time in Dubai was wonderful in so many ways. As I said earlier, I have always wanted to go to Dubai and I did. The buildings were huge, the architecture was spectacular, the amount of construction was mind numbing, the expensive cars were everywhere and what this city will look like in 20 years is pretty hard to imagine. It was what I expected and I really don’t need to go back anytime soon.